There’s a great range of shops, cafes, pubs and restaurants within 10 minutes drive of Graig Wen. From salt marsh lamb to Cardigan Bay crab and Dolgellau’s delicious specialty honey buns, you’ll find plenty to tingle your tastebuds! Dolgellau, Barmouth, Fairbourne and Tywyn are within easy reach and we are fortunate to have five restuarants mentioned in the Michelin Guide within 30 minutes drive. A new addition to the scene, just North of Barmouth, is Norbar (pictured above). You can dine al fresco on the terrace with far reaching sea views, eat in or take away fish and chips. We enjoyed good pizzas and burgers there on a sunny Sunday evening recently and the place was buzzing. 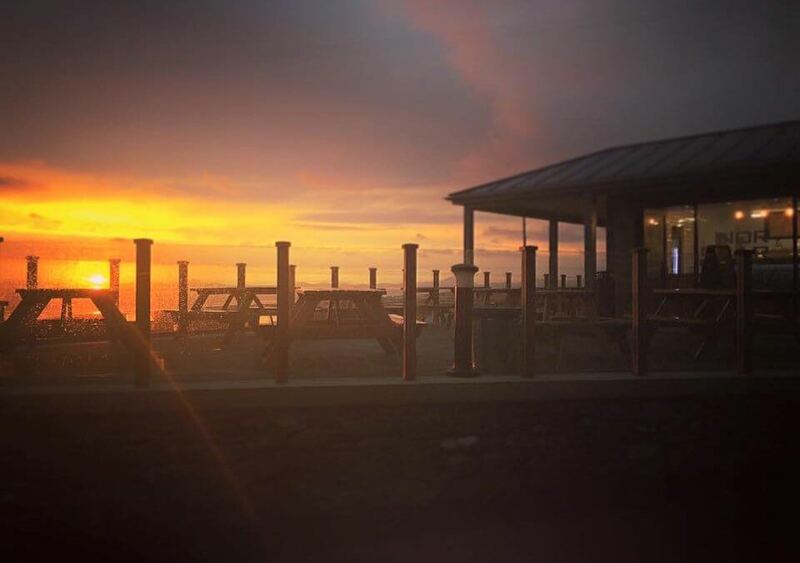 Dolgellau’s award-winning tapas bar, Tafarn y Gader, has just opened an outdoor seating area and Penrhyn Bar and Grill in Fairbourne has a large sunny patio to enjoy refreshments by the beach. We do advise booking before you get here if you would like to eat out in the evening during peak times such as Saturday nights and during school holidays. Some of our favourite places to eat are The Salt Marsh Kitchen, Indiana Cuisine, Bwyty Mawddach, Gwin Dylanwad Wine, Tafarn y Gader Tapas, bistro & bar, Y Meirionnydd Townhouse – Rooms, Restaurant & Bar, Coes Faen Spa BB and The Tilman, Barmouth. Good for families are Gatehouse Steakhouse Dolgellau, The Royal Ship Hotel and Y Sospan Cafe/Restaurant. Dog and family friendly places include Last Inn Barmouth Penryn Bar Fairbourne, Cross FoXes Bar Grill and Rooms, T H Roberts Coffee Shop, and Dolgellau Coffee Shop. The George III is a popular stop off on the Mawddach Trail. For a really special occasion Coes Faen Lodge opposite the iconic clocktower building near Barmouth Bridge serves Tuscan inspired food in a beautifully designed space. Or Penmaenuchaf Hall Hotel is a more traditional country house set in lovely grounds for fine dining or an indulgent afternoon tea.